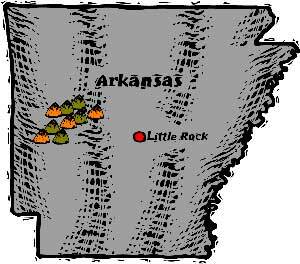 Arkansas is a beautiful land of mountains and valleys, thick forests and fertile plains. Northwest Arkansas is part of the Ozark Plateau including the Boston Mountains, to the south are the Ouachita Mountains and these regions are divided by the Arkansas River; the southern and eastern parts of Arkansas are called the Lowlands. The capital and most populous city is Little Rock, located in the central portion of the state, a hub for transportation, business, culture, and government. Known as “the Natural State”, the diverse regions of Arkansas offer residents and tourists a variety of opportunities for outdoor recreation. Hot Springs National Park was first established as a national site on April 20, 1832, to conserve the water from the 47 springs that emerge from Hot Springs Mountain and to ensure that water was made available for drinking and therapy. It is one of the smallest national parks in the country, but one of the most accessible and unique. Nicknamed “The American Spa,” people have used the hot spring water in therapeutic baths for more than two hundred years to treat rheumatism and other ailments. The park includes Bathhouse Row, itself a National Historic Landmark District. This grand collection of bathhouses is a beautiful example of late 19th century Gilded Age architecture. One of these buildings, the Fordyce Bathhouse, now serves as the park’s visitors center. Beyond the springs, the park also contains 26 miles of hiking trails, picnic areas and campsites in the surrounding Ouachita Mountain. Sight-seeing opportunities await you at nearby Hot Springs a unique city that is built in a circle around Hot Springs National Park (known for its mineral springs) providing an excellent area for hiking and horseback riding. Enjoy the peace and tranquility of beautiful Lake Hamilton and the various attractions available in Hot Springs National Park with 4,800 acres for hiking and horseback riding within a short drive. You can enjoy fishing and boating on beautiful Lake Hamilton or explore other area attractions including the crystal mines bath house row, the Mid-America Center Museum, the Arkansas Alligator Farm, and Oaklawn Race Track that has races from February through mid-April. For golfers there is an 18- hole course only minutes away. Magic Springs and Crystal Falls theme park is within 30 minutes. The beauty of the Ouachita Mountains and Hot Springs National Park surrounds you at The Wharf. Located along the shores of Lake Hamilton this luxurious retreat offers you not only a scenic setting but also activities and amenities catering to all your vacation needs. In addition to a number of water activities the resort offers tennis courts an outdoor pool a playground and a picnic area. Los Lagos at Hot Springs Village is the perfect four-season resort for your vacation. On-site activities include tennis badminton volleyball horseshoes and an outdoor pool. The village features six 18-hole golf courses two outdoor pools an indoor pool tennis and a playground and picnic area. SunBay Resort is set on the shores of Lake Hamilton in Hot Springs. This southern retreat offers you both quiet seclusion and a full line of recreational facilities. Fitness enthusiasts will rave about the resort’s health club that features Nautilus equipment an indoor pool two racquetball courts saunas and whirlpools. Outdoors there are two pools and four lighted tennis courts. The Arkansas Singles Connection, a member of the largest and most successful singles dating site on the web, has thousands of active listings of eligible single men and women across Arkansas and throughout the United States.